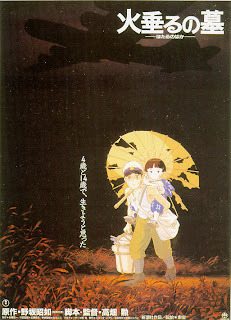 Grave of the Fireflies is the deeply moving tale of two siblings, 14-year old Sieta and his young sister, Setsuko, who find themselves homeless and alone when the Americans fire-bomb their village during World War II, an attack that kills their mother (their father is in the military, serving aboard a ship). For a short time, Sieta and Setsuko move in with their Aunt, but when she makes them feel unwelcome, the two set out on their own. Left with nowhere else to turn, they take refuge inside an abandoned bomb shelter, where they attempt to live normal, happy lives. However, when Setsuko grows ill due to lack of nutrition, Seita realizes he must resort to stealing food if he’s to have any chance at all of saving his beloved little sister. Grave of the Fireflies is beautifully animated, and there are some truly wondrous moments scattered throughout (in one breathtaking sequence, Sieta and Setsuko frolic and play as fireflies light up the night sky). 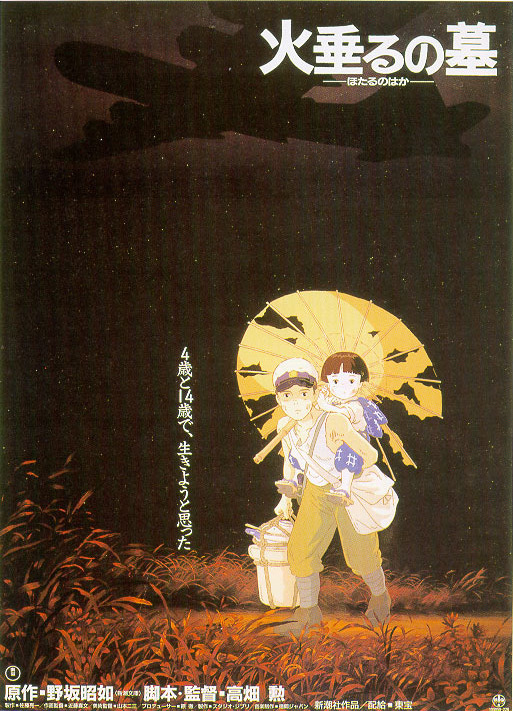 Still, Grave of the Fireflies is far from uplifting, and subtly relates a tragic tale of a brother and sister doing their best to survive in war-torn Japan. It’s a painfully sad story, to be sure, and what impressed me most as I was watching it was how director Takahata never once strains to reach us emotionally, avoiding the pitfalls of contrivances and over-sentimentality in favor of a gentle, even serene approach to the material. The war is undoubtedly the cause of the problems the two main characters face, yet rarely does warfare take center stage (save the attack on Sieta’s and Setsuko’s village). This is because Grave of the Fireflies isn’t a story of war, but of love, survival, and the heartbreak inflicted upon others not only by the enemy, but people they thought they could rely upon. An incredibly poignant experience, it’s safe to say you will not view anime the same way again after seeing this film. With Grave of the Fireflies, Takahata clearly demonstrates the power of the medium, and raises the bar not only for Japanese anime, but animation as a whole. One of the saddest films I've ever seen. @Kim: I definitely agree with you! Very, very sad. I literally cried watching it..